An automatic garage door can add convenience to your daily routine and make getting your car in and out of your home a lot easier. The benefit of opening and closing your door remotely is almost always taken for granted, just like any technology that we come to rely on as part of our day to day activities. When something happens that prevents you from using your remote to open or close the door, you'll definitely start to appreciate how good you had it. Not to worry, though. Our team can help you go back to your blissful ways. 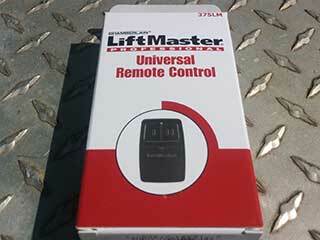 Garage door remotes are often made to be as small and simple as possible. This, unfortunately, means that they tend to be easily misplaced or damaged. A broken remote will force you to use your door manually until you have the unit repaired or replaced. Sometimes garage door remotes fail due to reasons that are unclear to the user. The circuitry within the transmitter or receiver could be damaged or other radio signals could be interfering with the mechanism. If your remote seems to be malfunctioning for any reason at all, our team can help. We work with major brands like LiftMaster, Genie, and the famous Chamberlain Clicker so you can count on us for a replacement remote that will be of a similar or higher quality. If a simple reprogramming is all that's required, we can do that too. Of course, your remote isn't the only thing that can malfunction. Wall mounted controls, as well as wireless keypads, can also develop some issues and require some repairs or replacement. Our team can fix them or install a new one in their place. But really, there is something you can do to do away with a lot of issues and make using your door remotely always available to you without having to carry any additional equipment than what you currently do. The best way to no longer have to deal with remote control problems is simple. Get a new opener. Wait, wait, hold on. We're not saying just buy any new opener. Modern models often come with special features that allow them to be smartphone compatible, which means you'll be able to use your phone to open or close your door from virtually anywhere. This will be an incredible addition to your convenience, not to mention, modern models are also far more secure and safer to use, and have a lot of other features, like a backup battery system or a digital lock, that by themselves are more than worth the investment. If your opener remote fails to work or if you're looking to get a new electric unit installed that will allow you to use your phone instead of a clicker, then give our team at Garage Door Repair Spring a call and we'll take care of whatever you need.